Stand Up Paddle Surfing: Waiting, dreaming, waiting! I was able to get out into the water today for an hour before low tide. Sheet glass and a nice little left running off into the big hole at the foot of my street. It was a super fun and clean little wave but nothing like what we've supposedly got coming. Now it's just a waiting game. And it's killing me! 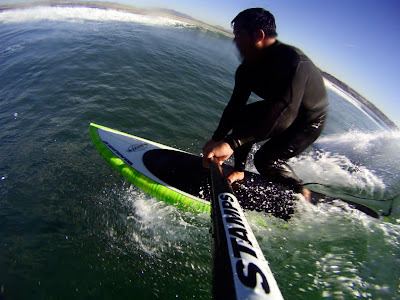 Photo: Paddle cam photo from last weekend. Dropping in and hoping that this one will stand up enough to get worked. Photo: Here's a shot from a hot little swell that pushed through town last summer. What a day! Glassy, warm, fun little waves zipping through the pier and throwing out nice little sections. This day was all about building speed and STICKING the rail off the bottom.